Darren Siwes, ‘Northie Kwin’, 2013, Giclee Print on Kodak Lustre, 120 x 100cm. Australia is a racist country. John Howard, who was Prime Minister at the time, publicly denied it in the wake of the 2005 Cronulla riots. Faced with the reality of xenophobic violence unfolding on the supposedly egalitarian beaches of Sydney’s suburbs, splashed across the media, his wilful denial was ludicrous. As any wannabe liar knows, just saying something doesn’t actually make it so. Australia is a racist country and you don’t need to look to dramatic events like the Cronulla riots or the Northern Territory intervention for proof. Even the art world, often seen as a middleclass bastion of liberalism, provides evidence. Racism is not a pretty picture. It’s not one we particularly want to see in art, especially when we realise that what we are looking at is a mirror. The group exhibition Debil Debil presents works by 13 Indigenous artists. The fact that the Australian art scene is largely segregated, with two distinct art markets, one for Indigenous and one for non Indigenous artists, is undeniable, but that’s not what I’m interested in here. What makes Debil Debil interesting is that it forced me to confront my own inherent prejudices. Debil Debil purports to be a show about ghosts and the ghosts of colonisation (and its toxic legacy) seem particularly prevalent. Overcoming my reticence to say anything less than positive, I’ll state the obvious. Not all Indigenous art is good art. And of course, as with all art, it’s subjective. Overall, in my opinion, Debil Debil is a mixed bag. Some works trade on notions of identity that we have seen many times before: they are obvious and easy. Others are so slick (more artifice than art) that they are devoid of conceptual punch. But the photos by Darren Siwes are so raw and confrontational that they reached out and smacked me right in the face. It wasn’t pleasant. But it was interesting. 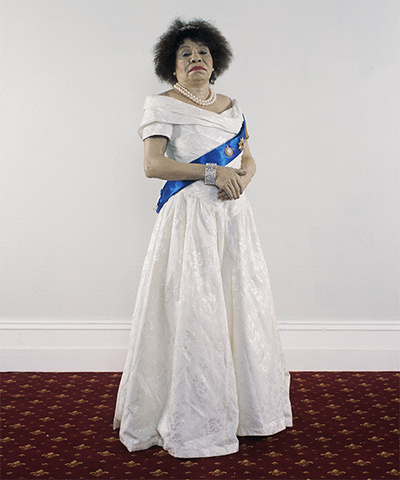 Darren Siwes, ‘Gudjerie Kwin’, 2013, Giclee Print on Kodak Lustre, 120 x 100cm. 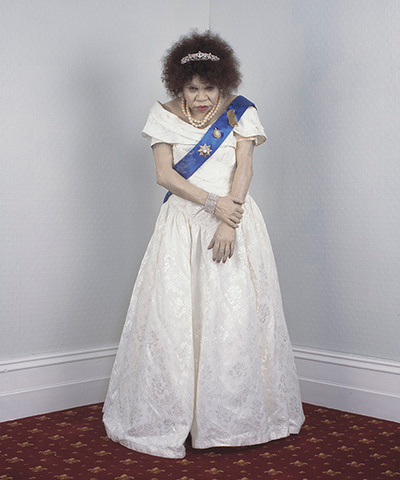 Siwes presents glossy photos of an Indigenous woman dressed as the Queen. In one image, she glowers in a corner looking more like a pissed off queen of the un-dead than a living, reigning monarch. In another, she strikes a pose of haughty disdain. Elsewhere, she is kept company by her consort. These images are both funny and confronting because she looks so very ridiculous; a reaction that raises uncomfortable questions. 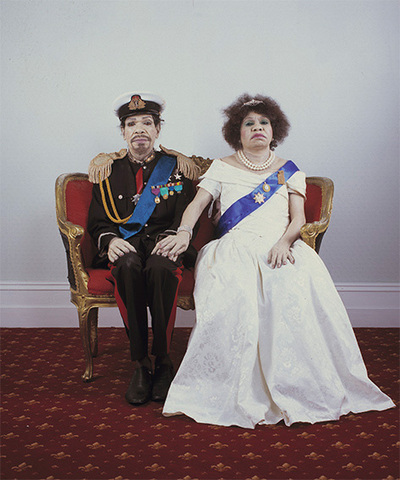 Darren Siwes, ‘Jingli Kwin’, 2013, Giclee Print on Kodak Lustre, 120 x 100cm. Is it latent racism that makes her look so silly? (The very idea that an Indigenous person could be Queen of England, and by extension Australia, is just so… unlikely.) Is it the crudely applied make-up? Is this a deliberate nod to the fact that she is playing dress-ups? Is this itself another racist thought? An infantilisation of the subject; placing her in the position of imitating her elders (and by implication betters)? Is it the pomp and circumstance of the European royalty itself that is actually ridiculous? If a white person dressed up as a tribal elder, would that be funny? Racist? Ridiculous? Siwes’s images don’t provide the answers to these awkward questions. But they don’t have to. Raising questions is what good art does. The answers are up to us. headlong into a self-interrogation of my own attitudes and conditioning vis-a-vis Otherness and Difference. These are some of the most disquieting images I’ve yet seen in the context of art dealing with Australian-ness. Siwes’ series must also undoubtedly evoke the cruelly patronising Aboriginal ‘king’ and ‘queen’ breastplates, an aspect of aberrant Australian history that has obviously not yet been brought to book, with the breastplates continuing to be sought after by auction houses. Indeed. These images are a mirror. And not a flattering one! more, more. i want more. what a great article.